CONFERENCE LOCATIONS: The Preconference on Thursday is in a separate location from the main conference this year. If you are attending the Preconference, view the LOCATION page for details. INTERACTIVE CONFERENCE SCHEDULE - View the interactive schedule and build a personalized itinerary. Log into your DASHBOARD and choose MY SCHEDULE to get started. From there you can search by presentation title, speaker or moderator name, session format, conference track, location, day or time. A few days before the conference, you will even have the option to download handouts and presentation slides. TICKETS & REGISTRATION - Speed through the registration line by getting your CONFERENCE TICKET in advance! Creating a Profile on this website is only the first step and does not grant entry to the conference, only having a ticket does. This applies to everyone, including presenters, co-presenters, posters, volunteers, etc. Login to your DASHBOARD and click the TICKETS tab to view your tickets or to buy a ticket. For help, email info@IM4US.org. FRIDAY EVENING RECEPTION - RSVP for the Friday Evening Networking & Poster Reception. Conference attendees get in free and guest tickets are $25 each online and $30 at the door. Please visit the Eventbrite RSVP page for details. RSVP by August 15th! 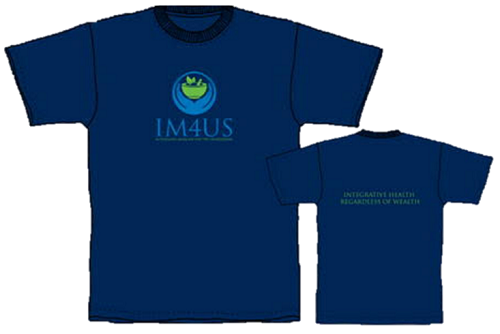 IM4US T-SHIRTS - Wear your IM4US spirit literally on your sleeve! BUY A T-SHIRT today and pick it up at the conference. T-shirts will not be sold on site due to venue policies. FRONT: IM4US Logo. BACK: "Integrative Health Regardless of Wealth!" UPDATE YOUR PROFILE - Your basic profile information is shared with attendees so be sure it's up-to-date, including uploading your profile picture so conference attendees can recognize and connect with you on site! Log into your DASHBOARD to review and update your profile. CONNECT WITH ATTENDEES BEFORE THE CONFERENCE! - You don't have to wait until you arrive at the conference to meet your fellow attendees. Log in to the conference website and click the ATTENDEES tab to see who's coming and reach out in advance. On your mobile phone, go to the App Store (for Apple iPhone) or Google Play (for Android phones). There is no app for iPad, but the website has been optimized for mobile devices such as iPads and other tablets. Search for and then download the Dryfta Application. Open it once it's downloaded. Search for "IM4US" and then click to open. Log in to view your personal details, such as your personalized itinerary and your profile.